This story is part of SF’s 50 for 50 campaign, highlighting 50 special SF alumni and friends during our 50th-anniversary celebration. To share your story visit http://www.sfcollege.edu/50/submit.php. Ralph Cameron is a fourth generation Gainesville native and a 1971 graduate of Gainesville High School. In 1976, Ralph graduated from SF’s first building construction class. To this day, he proudly displays his SF diploma in his home office. Ralph is a realtor with Coldwell Banker M.M. Parrish. Ralph served as president of the local Association of Realtors, chaired committees on the local and state level and is a Leadership Gainesville graduate. He was president of the Gainesville Board of Realtors in 1986, Realtor of the Year in 1987, District Vice President of the Florida Association of Realtors in 1988, and was chosen “Realtor Most Active in Politics” by the Florida Association of Realtors in 1990. 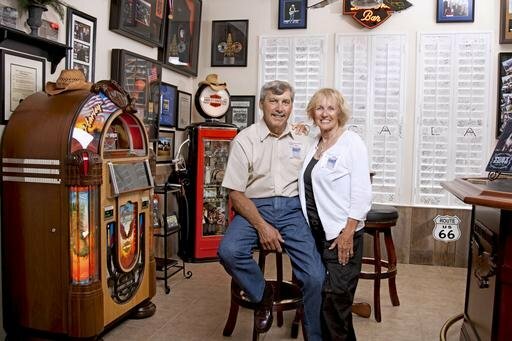 Ralph and his wife, Bonnie, are the founders of Bikers on Parade for the USA, the largest and longest veteran’s motorcycle parade in the U.S. Ralph and Bonnie have logged over 180,000 miles on their Harleys to all 48 lower states and Canada. It was his love of Harleys and his country that inspired Ralph to create one of the most successful fundraisers Alachua County has ever seen in terms of participation. One that earned him a rarely given “Key to the City” in 2007, now proudly displayed in his home. Santa Fe College served as the starting point of the parade each of the nine years it was held from 2001 – 2009. The event proved to be wildly successful, raising a total of $510,000 to benefit local veteran’s charities and the local Red Cross chapter. At the end of the final ride, a Veterans Bridge Endowment fund was established at Santa Fe College in the name of Bikers on Parade for the USA. The fund awards scholarships on an annual basis to a combat wounded veteran, female veteran, and first-generation in college veteran.